The incidence of most skin cancers increases with age. They tend to occur on sun-exposed parts of the body. Sun exposure early in life may result in a skin cancer many years later. As a result of excessive sun exposure, increased foreign travel and an ageing population, it is recognised that there will be a large increase in skin cancer in the next few decades. Plastic surgeons commonly treat skin cancer because they have the techniques to close wounds regardless of their complexity. This means that we can confidently remove the tumour knowing that the wound can be repaired. The priorities for treatment are complete removal of the cancer, achieving rapid healing, and getting the best possible appearance. There are three types of skin cancer that people need to be aware of. These are basal cell cancer and squamous cell cancer; both of which are classified as non-melanoma skin cancer, and the third, which is known as melanoma. Basal cell cancer is the most common and is often easily treatable. Squamous cell cancer and malignant melanoma are often serious and need to be treated urgently. In the case of squamous cell cancer and malignant melanoma, early diagnosis and intervention are essential. Within the NHS, patients with either of these conditions when referred by a GP with this as a diagnosis should be seen by a specialist within two weeks. Treatment is also often prompt. Private consultation can often offer even more rapid treatment and also offer more choice in terms of when and where the treatment is carried out, this also applies to the treatment of basal cell carcinoma which can’t be given the same priority within the NHS. Basal cell carcinoma is very common. It is usually found on the head and neck, but can occur at other sites. Its development often can be linked to lifetime cumulative sun exposure; the incidence therefore increases with age. The patient will usually notice a scaly crusted area ,spot, or red patch. It may itch or bleed. As it grows very slowly and does not spread, basal cell carcinoma can often be treated easily when it is of a small size. However, if treatment is delayed surgery can be more complex therefore prompt diagnosis and treatment is preferable. If you are diagnosed by your GP with basal cell carcinoma and seek private treatment an urgent outpatient appointment will be arranged. Mr Hill will confirm the diagnosis by examination, and may take a small biopsy to confirm the diagnosis. Following this if the diagnosis is confirmed an urgent date for surgery will be arranged. Excision surgery for basal cell cancer is often simple and safe. You will be treated on an outpatient basis, meaning that you will be treated and discharged all in the same day. The surgery requires local anaesthetic only, and involves removal of the basal cell carcinoma and in most cases closure with sutures, although more complex surgery may be required. The nature of the surgery will have been discussed in detail at the first outpatient attendance. There will be scarring, but Mr Hill will do all he can to keep this scarring to a minimum. ￼Squamous cell carcinomas are less common. They are often a scaly patch or ulcer. Also caused by cumulative sun exposure, squamous cell cancer can be more serious. Most patients present early and small lesions can often be treated by a simple local anaesthetic operation with further problems being highly unlikely. More advanced lesions do carry a risk of recurrence even after complete removal, and can spread to other parts of the body. The surgical procedures for the treatment of squamous cell carcinoma are much the same as those for basal cell carcinoma. ￼It has been estimated that the lifetime risk of developing malignant melanoma is 1 in 91 for men and 1 in 77 for women in the UK. These were calculated in February 2009 using incidence and mortality data for 2001-2005. It is thought that short, intense bursts of exposure to the sun are a significant causative factor in its development. Melanoma is the type of skin cancer that arises in moles(naevi) or brown spots. It is less common than the other sorts, but can be more serious. The majority of patients with early diagnosis can be cured by simple removal, but melanoma can come back after removal and spread elsewhere in the body. The most important symptom in melanoma is a history of change so you should keep an eye on your moles. It is normal for moles to gradually change through your life and to develop new moles over time. Usually they become slowly raised and get paler. They may grow hair. These gradual changes are not of serious significance, but if you have any doubt you should see your doctor. If a mole or brown spot in the skin changes over a course of weeks or months in terms of shape or elevation, develops an irregular edge or irregular colour, is itchy or bleeds, you should show it to your doctor. This must be treated rapidly and the diagnosis whilst being suspected can only be confirmed following surgical removal of the lesion. Surgical excision of the suspicious lesion will be arranged very urgently. Following removal of the lesion the diagnosis will be confirmed by a pathologist who will measure the thickness of the melanoma. The thickness of the melanoma will determine the extent of the further surgery required. Mr Hill explain what treatment is required in line with national guidelines. This shows a small but typical basal cell carcinoma. This is an early squamous cell carcinoma. 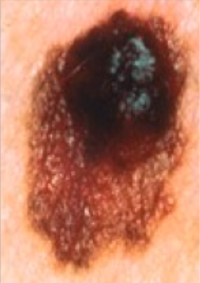 This is a melanoma. Note it has an irregular shape and irregular pigmentation. These are all typical features of melanoma.